So I'll preface this by saying that my day count is off and I'll now be titling each post by the location of the town. Today began like every other day on the Journey of Hope, a 5 AM wake-up mix that I had the opportunity to create. Today's mix included Counting Crows, Zac Brown Band, Old 97's, and others. After packing our sleeping bags and air mattresses we gathered to eat our usual bagels with peanut butter and honey and a bowl of cereal. One tradition we have on the JOH is that if you leave something in the crew vehicle or if you forget something in lodging you have to dance at morning circle up to get it back. I've danced several times this summer already, but caught some of the guys in the act today. Our scheduled ride was 100 miles today but our project manager spoke with some locals and decide to take interstate 25 for part of the ride to reduce it to 75 miles. Once on the road we learned we would be riding the whole day on I-25 shortening our ride to 70 miles. I unfortunately forgot to charge my computer, so I know have to add 150 miles to my trip odometer. Today was the most physically and mentally challenging day for me so far. We were all feeling the ride from yesterday and no matter how hard I seemed to push on the pedals, the rolling hills and strong head winds seemed to get the best of me. To add to the challenge of the ride we had a scheduled lunch with another cattle woman association and had to make rack point by 11, which proved to be more difficult than we initially thought. My pace line had two flats within five minutes and finally had one member rack because he wanted us to make the rack point. The three us pushed hard for the next hour but unfortunately missed the rack point by about 5 minutes, making today my first time racked other than for construction. Only one paceline made the rack point, leaving 12 racked because of time, 2 racked for knee issues and 3 because of damaged bikes. 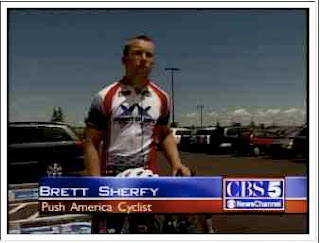 When we arrived we had a news crew waiting to film our arrival and I was fortunate enough to have an interview; check out the article and video links below. We immediately cleaned up and headed off for or cattle woman lunch at a local ranch; the lunch was phenomenal and the Cowbell ladies were extremely friendly and supportive of our ride. After lunch we washed the vans at a local DIY car wash and headed back to lodging for a quick break before our evening friendship visit. Tonight we met with the ARC of Cheyenne and had my first really special friendship visit where I met several amazing people, John who was great with a Frisbee and worked for the state of Wyoming packing license plates; Chris and JR were special Olympic athletes that joined in our Frisbee game and had a dance off before evenings end. This has been my favorite friendship visit so far. Everyone seemed a little down on the way there especially after most of us being racked and as soon as we met everyone and they were excited to have us there and look forward to us coming each year, everyone instantly had smiles on there faces. One thing I've realized is that the ride is just to get from place to place, the real Journey is through the people we meet and affect. Posted by Unknown at 7:07 PM I'm reading from MyDailyGround: Cheyenne Tweet this!